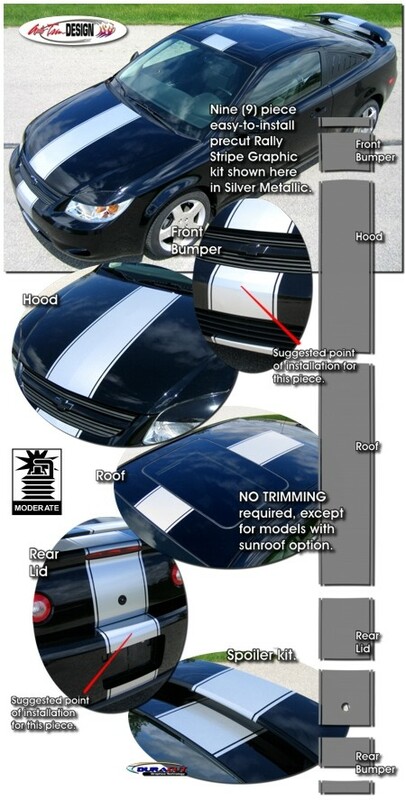 Make your ‘05-'10 Chevrolet Cobalt Coupe great looking with this Rally Stripe graphics kit. Easy-to-install kit is packaged as a set of nine (9) or thirteen (13) pieces, depending on the kit selected, with a .50" (12.7mm) pinstripe at each side separated with a .25 (6.35mm) space as shown. They're PRECUT, ready to apply in a wide variety of colors - NO TRIMMING required (except for Cobalt models with Sunroof option)! Stripe package is not just a 12" (30.48cm) strip in a box. Kit consists of prefitted, tapered and contoured pieces as shown. This kit is specifically made for the '05-'10 Cobalt Coupe factory hood, roof and rear lid areas and will not fit any other vehicle. A precut piece for Cobalt's factory spoiler is also included. Rear Lid Chevy Bowtie emblem was removed as shown (can easily be reinstalled over the stripe, if desired). Moreover, a two (2) piece High-Mount Spoiler kit (ATD-CHVCBLTGRPH21) is available for '08-'10 Cobalt SS Turbocharged models with this option. Trimmable one (1) piece Spoiler Kit (ATD-CHVCBLTGRPH7) includes one (1) 12" x 16" (30.48cm x 40.64cm) piece that can be hand trimmed for custom spoiler applications.